Click here to download the entire Supreme Court decision on Hacienda Luisita case – G.R. No. 171101. Philippine Daily Inquirer’s Marlon Ramos filed this report: The Supreme Court ordered the distribution of more than 4,900 hectares of Hacienda Luisita lands to over 6,000 registered tenants of the sprawling agricultural estate owned by the relatives of President Aquino. Voting unanimously, the 14 justices of the tribunal agreed to void the stock distribution plan which Hacienda Luisita Inc. offered to farmworker-beneficiaries (FWBs) in lieu of actual land ownership. “Upon a review of the facts and circumstances, we realize that the FWBs will never have control over these agricultural lands for as long as they remain stockholders of HLI,” the court said in its 56-page decision. The ruling penned by Associate Justice Presbitero Velasco Jr. was promulgated on Nov. 22, but was officially released to the media on Thursday. Senior Associate Justice Antonio Carpio inhibited himself from the deliberation of the decades-old land dispute. While they all agreed to the total land distribution, some of the justices had different views on the land valuation. Chief Justice Renato Corona and Associate Justices Lucas Bersamin and Arturo Brion issued their separate concurring and dissenting opinions. 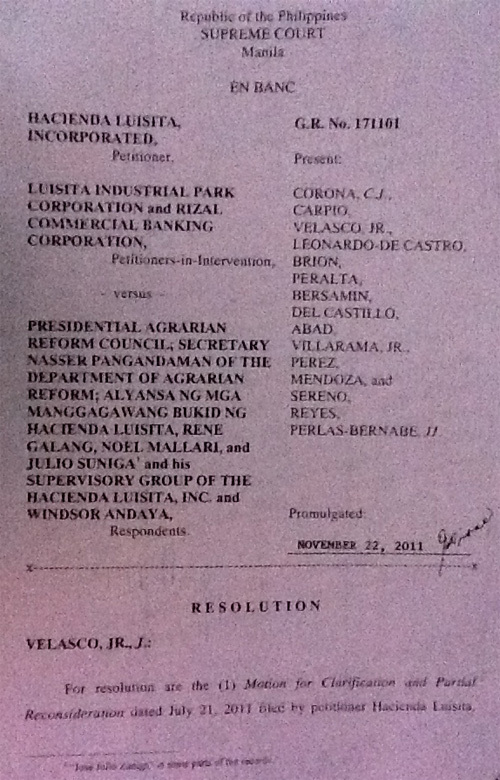 WHEREFORE, the Motion for Partial Reconsideration dated July 20, 2011 filed by public respondents Presidential Agrarian Reform Council and Department of Agrarian Reform, the Motion for Reconsideration dated July 19, 2011 filed by private respondent Alyansa ng mga Manggagawang Bukid sa Hacienda Luisita, the Motion for Reconsideration dated July 21, 2011 filed by respondent-intervenor Farmworkers Agrarian Reform Movement, Inc., and the Motion for Reconsideration dated July 22, 2011 filed by private respondents Rene Galang and AMBALA are PARTIALLY GRANTED with respect to the option granted to the original farmworker-beneficiaries of Hacienda Luisita to remain with Hacienda Luisita, Inc., which is hereby RECALLED and SET ASIDE. The Motion for Clarification and Partial Reconsideration dated July 21, 2011 filed by petitioner HLI and the Motion for Reconsideration dated July 21, 2011 filed by private respondents Noel Mallari, Julio Suniga, Supervisory Group of Hacienda Luisita, Inc. and Windsor Andaya are DENIED. All salaries, benefits, the 3% of the gross sales of the production of the agricultural lands, the 3% share in the proceeds of the sale of the 500-hectare converted land and the 80.51-hectare SCTEX lot and the homelots already received by the 10,502 FWBs composed of 6,296 original FWBs and the 4,206 non-qualified FWBs shall be respected with no obligation to refund or return them. The 6,296 original FWBs shall forfeit and relinquish their rights over the HLI shares of stock issued to them in favor of HLI. The HLI Corporate Secretary shall cancel the shares issued to the said FWBs and transfer them to HLI in the stocks and transfer book, which transfers shall be exempt from taxes, fees and charges. The 4,206 non-qualified FWBs shall remain as stockholders of HLI. DAR shall segregate from the HLI agricultural land with an area of 4,915.75 hectares subject of PARC’s SDP-approving Resolution No. 89-12-2 the 500-hectare lot subject of the August 14, l996 Conversion Order and the 80.51-hectare lot sold to, or acquired by, the government as part of the SCTEX complex. After the segregation process, as indicated, is done, the remaining area shall be turned over to DAR for immediate land distribution to the original 6,296 FWBs or their successors-in-interest which will be identified by the DAR. The 4,206 non-qualified FWBs are not entitled to any share in the land to be distributed by DAR. HLI is directed to pay the original 6,296 FWBs the consideration of PhP 500,000,000 received by it from Luisita Realty, Inc. for the sale to the latter of 200 hectares out of the 500 hectares covered by the August 14, 1996 Conversion Order, the consideration of PhP 750,000,000 received by its owned subsidiary, Centennary Holdings, Inc., for the sale of the remaining 300 hectares of the aforementioned 500-hectare lot to Luisita Industrial Park Corporation, and the price of PhP 80,511,500 paid by the government through the Bases Conversion Development Authority for the sale of the 80.51-hectare lot used for the construction of the SCTEX road network. From the total amount of PhP 1,330,511,500 (PhP 500,000,000 + PhP 750,000,000 + PhP 80,511,500 = PhP 1,330,511,500) shall be deducted the 3% of the proceeds of said transfers that were paid to the FWBs, the taxes and expenses relating to the transfer of titles to the transferees, and the expenditures incurred by HLI and Centennary Holdings, Inc. for legitimate corporate purposes. For this purpose, DAR is ordered to engage the services of a reputable accounting firm approved by the parties to audit the books of HLI and Centennary Holdings, Inc. to determine if the PhP 1,330,511,500 proceeds of the sale of the three (3) aforementioned lots were actually used or spent for legitimate corporate purposes. Any unspent or unused balance and any disallowed expenditures as determined by the audit shall be distributed to the 6,296 original FWBs. HLI is entitled to just compensation for the agricultural land that will be transferred to DAR to be reckoned from November 21, 1989 which is the date of issuance of PARC Resolution No. 89-12-2. DAR and LBP are ordered to determine the compensation due to HLI. DAR shall submit a compliance report after six (6) months from finality of this judgment. It shall also submit, after submission of the compliance report, quarterly reports on the execution of this judgment within the first 15 days after the end of each quarter, until fully implemented. The temporary restraining order is lifted. ROBERTO A. ABAD MARTIN S. VILLARAMA, JR. This entry was posted on Thursday, November 24th, 2011 at 1:15 pm	and tagged with current events, Hacienda Luisita, news, pres. noynoy aquino, Presbitero Velasco, renato corona, supreme court of the philippines and posted in journalism, philippines, politics. You can follow any responses to this entry through the RSS 2.0 feed.